The helicopter is operated by a crew of four, maintained by a team of engineers, and supported by a team of dedicated airport staff all year round – 24/7/365. The most northerly base in Ireland, it deals with the stern challenges posed by the Atlantic Ocean and the clifftop environment along the north-west coast. The aircraft is often called upon to rescue casualties from remote rural areas in the west of Ireland which greatly reduces their transfer time to hospital. The base also carries out rescues from the many islands of the west coast and also within Northern Ireland. 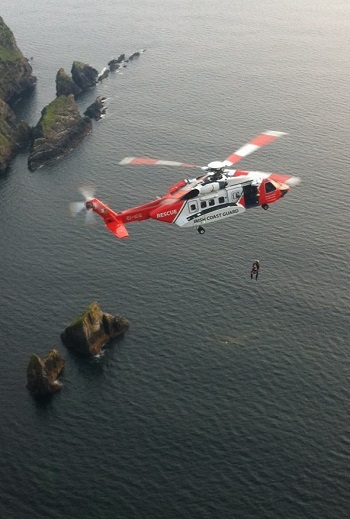 The IRCG co-ordinates Search and Rescue (SAR) through its Maritime Rescue Co-Ordination Centre (MRCC) in Dublin (located in Leeson Lane off Leeson Street) and Maritime Rescue Sub-Centres (MRSC) at Malin Head, Co. Donegal and Valentia Island, Co. Kerry.